Characters on the cover: Leela. "Trading Spaces" is the seventy-second comic issue, released on 3 September, 2014 in the US. After a successful delivery of porta potties to the Burning Man planet, Fry, Leela and Bender relax onboard the Planet Express ship, claiming it was the best delivery ever. However, their peaceful mood is soon interrupted when they receive a distress call from a ship being sucked into a black hole. Reluctantly, Leela agrees to try and rescue it. Upon arriving at the scene, the ship is revealed to be the Nimbus, which got caught in the pull of the black hole after Zapp Brannigan attempted to stage the rescue of a Star Tours space bus full of elderly people (however, Kif explains that the real reason they were there was so that Zapp could show-off). Leela manages to rescue the Nimbus and the Star Tours bus by flying directly into the black hole and turning it inside-out. Back on Earth, Leela is seen as a hero by the news, causing President Nixon to lose all faith in Zapp and look for a way out of yet another P.R. nightmare. Nixon calls both Leela and Zapp to the Oval Office, where he puts Leela in command of the Nimbus and dishonorably discharges Zapp. Now without a ship captain, Planet Express begins conducting interviews to find a new one, but Zapp shows up and forcibly takes the job himself. He tells the others that he can prove that Leela is an incompetent captain, meaning she will lose her new job and allow him to attempt to get his back. Meanwhile, Leela's first week on the Nimbus goes extremely well; she raises recruitment, boosts morale and even wins the "Captain of the Week" award for setting the Nimbus' record number of consecutive days without casualties. However, the power and success goes to Leela's head, and she starts to put all of the soldiers in danger, gain weight and become more and more like Zapp. Desperate, Kif calls Zapp for help. Shortly thereafter, Leela decides to preemptively strike a giant, laser-wielding space station known as the Omega Laser Obliterax, which is powerful enough to obliterate everything within 10 light years in a single shot. Luckily, Zapp, Fry and Bender show up in time to convince Leela what a terrible captain she has become; and using mirrors they were meant to deliver to the Funhouse planet, manage to deflect the shot fired by the space station. Later, back on Earth, Leela turns-in her uniform to Nixon, who then rehires Zapp. Bender: Oh well, we tried our best. Let's go home. Leela: Not yet. I have an idea so absurd that it defies the laws of even comic book logic! Leela: Now I know exactly how Bender feels when he says how great he is every ten minutes. Zapp: Did Jesus fill out an application when the universe needed a hero who could defeat evil with nothing more than some fish, a pair of sandals, and a manger filled with radioactive barnyard animals? Zapp: That's right, Fry. He didn't! Leela: Zapp?! What are you doing here?!? Zapp: Delivering a very seductive package...me. The issue's title is likely a reference to the 1983 film Trading Places and the fact that the Nimbus is usually in space. The crew of the Nimbus visit Transformers homeworld Cybertron. Three references to the Halo franchise are made. Kif tells Leela that they have lost the Halo to the Covenant, then many DOOP soldiers are seen being held hostage by Covenant Elites. The Monolith and Discovery One from 2001: A Space Odyssey appear. A Phantom Zone mirror from Superman appears. The derelict ship from Alien appears. The Silver Surfer appears again. This is his third appearance. The following can be seen in Kif's quarters on the Nimbus: a poster for the 1964 French musical The Umbrellas of Cherbourg, an anime-looking poster of a blonde girl and a copy of the novel City of Bones. Leela says she's updating her Facebag status, a reference to social networking site Facebook. Facebag was previously mentioned in "Decision 3012". 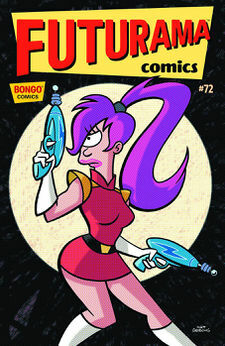 With this issue, Futurama Comics equals the original run in number of installments. A Star Tours bus previously appeared in "That's Lobstertainment! ".